Supporters of a bill intended to crack down on bullying in schools gathered yesterday at a State House press conference, hoping to build momentum for the proposal, which is expected to be considered by the Senate today. The measure, approved by the Joint Committee on Education last week, attempts to address old-style, in-person bullying, the kind that has plagued schools for years, and cyberbullying of students over the Internet. 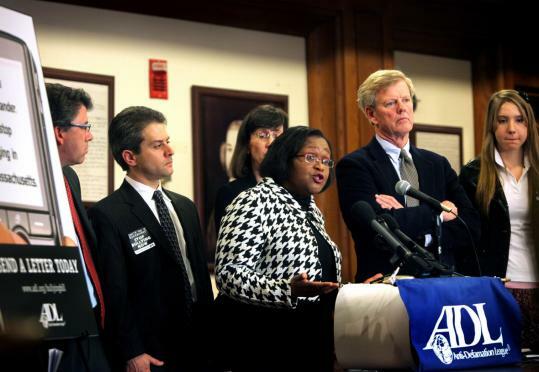 “This comprehensive approach to prevent bullying and deal with it when it does happen is overdue in Massachusetts,’’ said Derrek Shulman, the director of the Anti-Defamation League New England office. The push for the legislation comes after recent high-profile cases of youths being abused by bullies. Phoebe Prince, 15, of South Hadley committed suicide in January after allegedly being abused both in school and online by classmates at South Hadley High School. The bill defines and bans bullying and cyberbullying; prohibits retaliation against anyone who reports it; requires schools to develop bullying prevention lessons; requires staff to report bullying to the principal; and requires the principal to investigate and take appropriate action. The principal must also notify police if he or she believes criminal charges are warranted. Criminal charges may be brought in cases where the bullying has escalated, to threats or assaults, for example, Shulman said. He said the ADL is leading a 50-member coalition of organizations ranging from the Massachusetts Association of School Committees and the Massachusetts Teachers Association to the Massachusetts Chiefs of Police Association and Microsoft Corp.
Forty-one other states already have such a law, Shulman said. He said he was confident that both the House and Senate would pass versions of the bill. The governor, Senate president, and House speaker have all urged strong legislation to stop bullying. “If you think about it, children, psychologically, they’re very fragile,’’ said Senator Kenneth J. Donnelly, the Senate vice chairman of the committee.